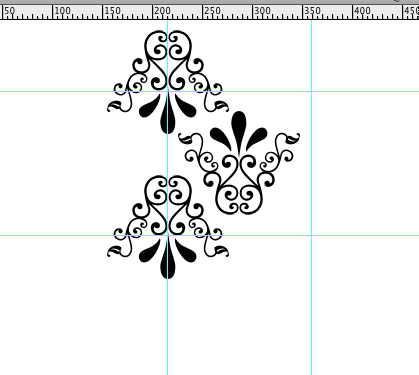 To first start the pattern, we are going to use a custom shape from Photoshop. 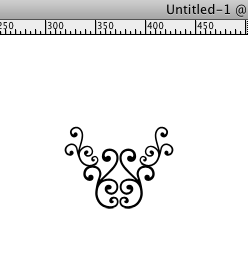 You want to grab the Custom Shape tool by using your tool palette or by simply typing ‘U’. 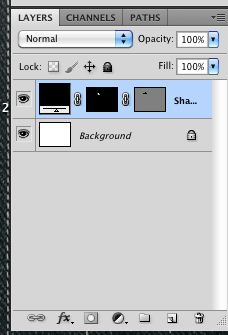 If another shape comes up (such as the Rectangle Tool), at the top of your window you should be able to select the Custom Shape tool (it kind of looks like an ink blot). 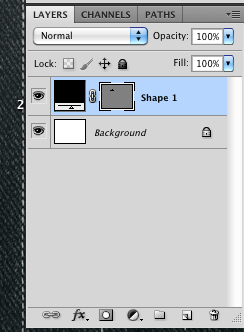 Click on the drop-down arrow to get to the menu of shapes. Open up the ‘Ornaments’ package. 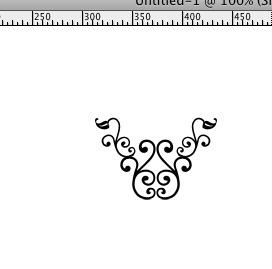 We will be using ‘Ornament 5’ (2nd column, 2nd row). 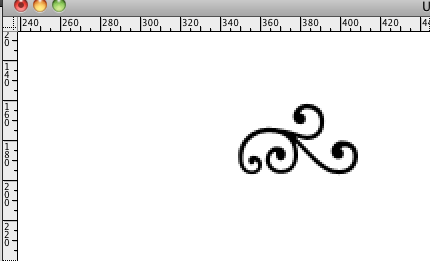 Select your shape, and hold down your Right-Click + Shift to create the shape. 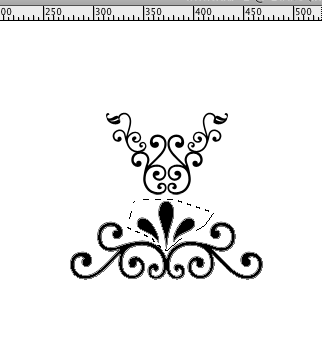 Make it as big or small as you want (the above picture is blown up a bit). Once you get it the size you like we are going to only use a piece of the ornament. 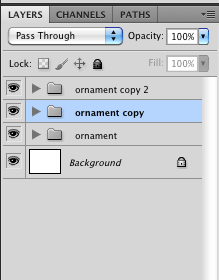 Grab your Lasso tool (‘L’, any except for the Magnetic Lasso), and make a selection around the portion of the ornament you want to keep. 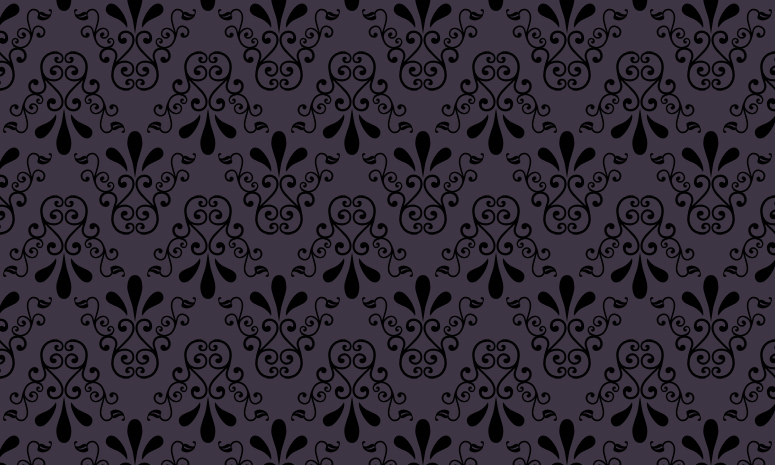 Press ‘D’ to make sure your colors have defaulted (Black Foreground, White Background). 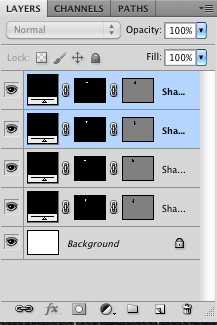 Making sure you still have your selection from Step 4, you want to ‘Add Layer Mask.’ The easiest way to do this is to locate your Layers Palette and click the third button from the left on the bottom of your Layers Palette (the white circle surrounding the gray rectangle). 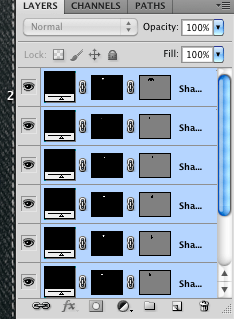 This removes the remainder of the selection without totally getting rid of it. 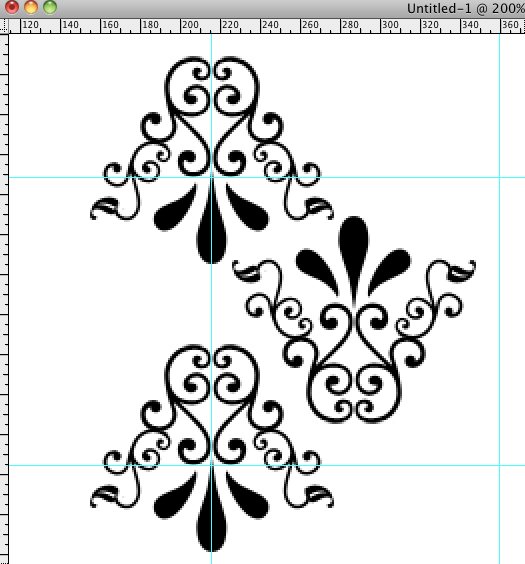 Now we are going to add some leaves to what we already have to add a bit of style. 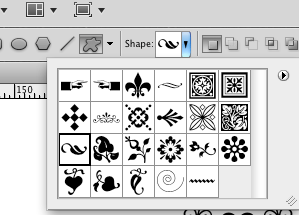 Go back to your Custom Shapes (‘U’) and in your Ornaments pack, grab ‘Leaf Ornament 2’ (first column, third row). 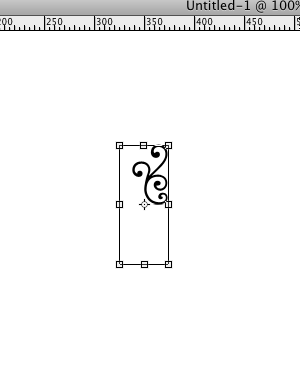 Create your shape anywhere on your canvas. 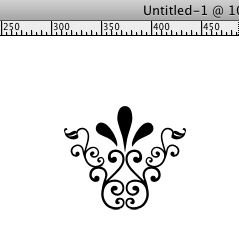 Then make a selection, using your Lasso Tool so that you only keep the leaf and get rid of the stem. 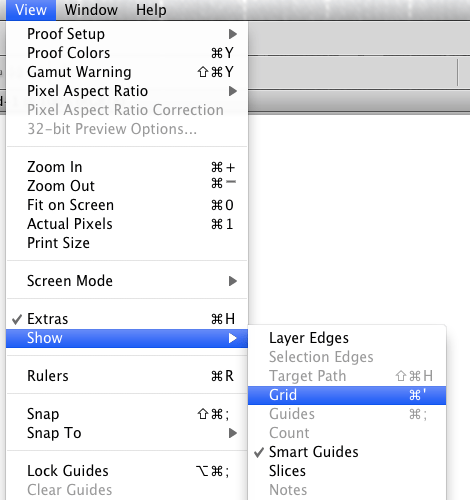 Push the ‘Add Layer Mask’ button on your Layers Palette. 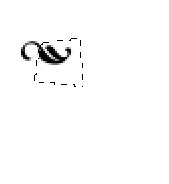 Erase pieces of your original shapes to make it look like one big shape. 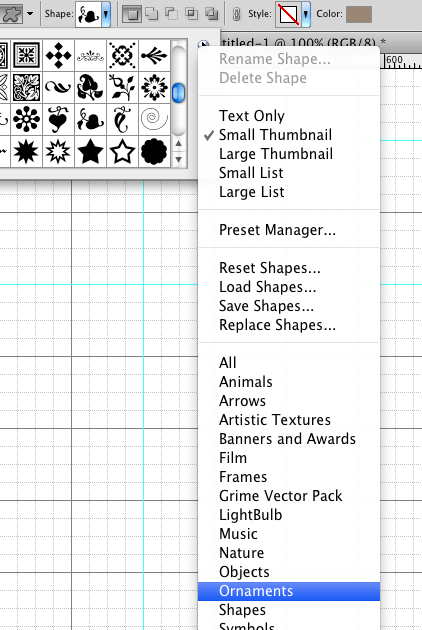 Select the Layer mask attached to your original shapes and pick a small, hard eraser (‘E’) to make everything look consistent. 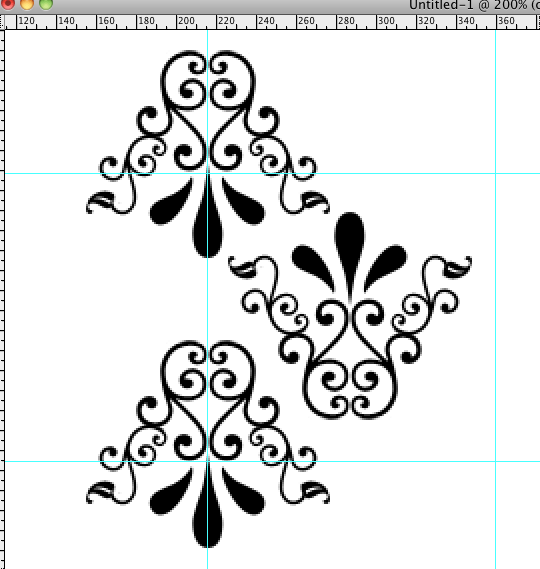 To finish off the design, we are going to add one more piece. 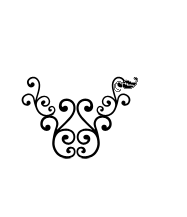 Get back to your Custom Shapes (‘U’) and select the first shape we used (‘Ornament 5’). 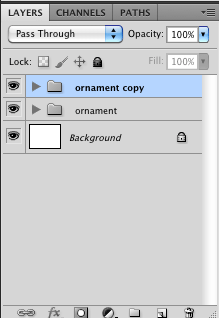 You want to make it a bit bigger than before and select the top portion of the ornament to keep. 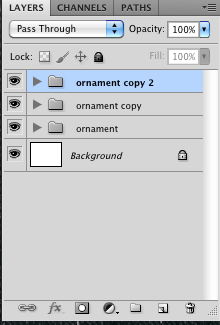 When you get your selection, you want to move it so that it is at the top center of the ornament. That’s it for your shape! 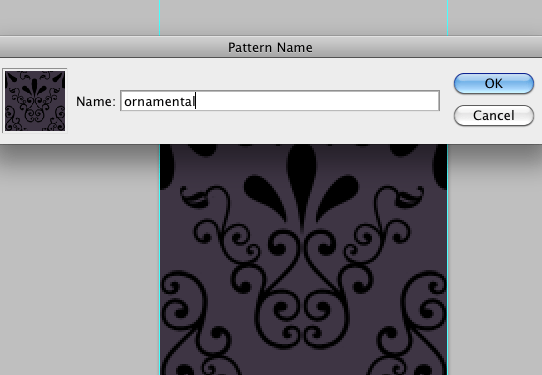 Once you do that, you want to name the Layer Group–‘ornament’ will suffice. 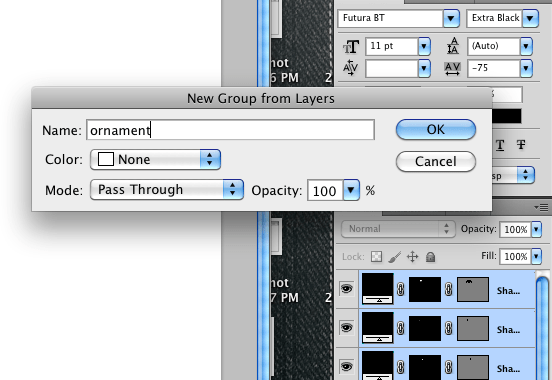 Once you create the Layer Group, you want to Duplicate your group by dragging the group to the ‘New Layer’ button at the bottom of the Layers Palette. 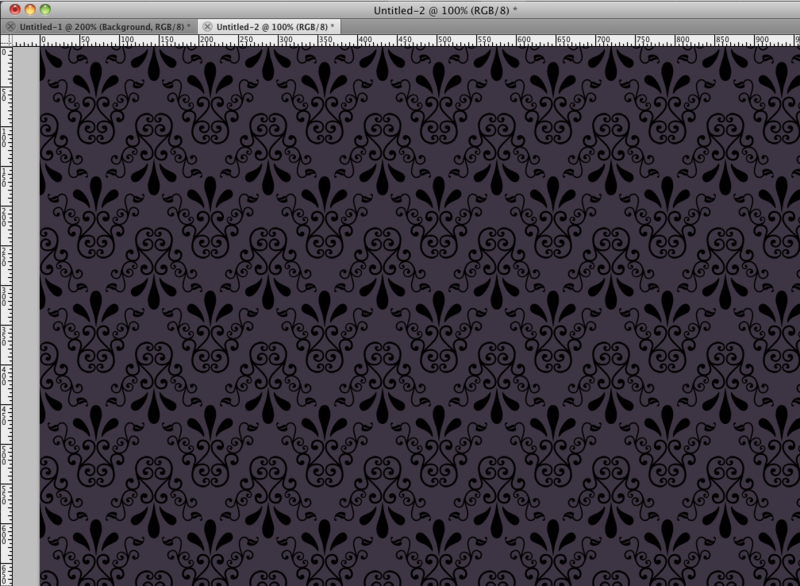 You can turn your Grid on to help you create a pattern within a box (Ctrl/Cmd+’). 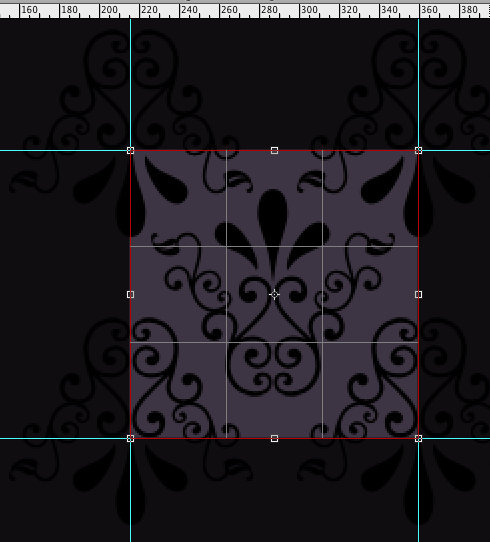 I created guides from my Rulers (Ctrl/Cmd + R) to help create a box out of the grids. 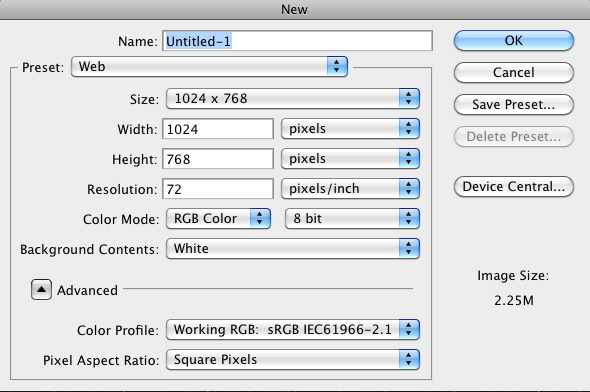 Select your two new group layers and Flip them vertically (Edit > Transform > Flip Vertical). Set them up so that your original ornament is considered the inside of the box (created by the Guides). Your vertical ornaments need to be set up so that whatever is inside the box on the top, is outside the box on the bottom. Add some color to your background. 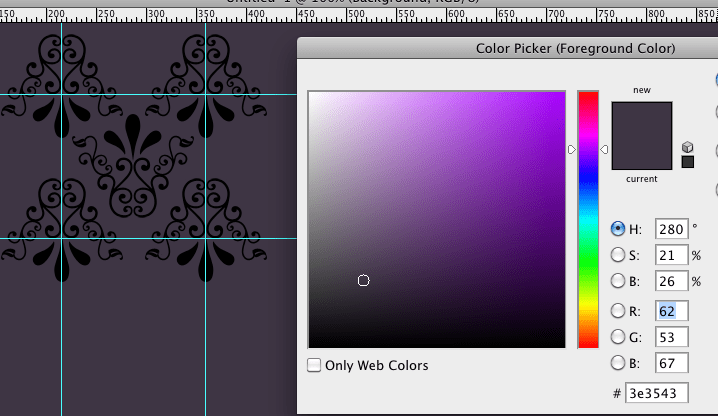 I chose this purple color, but grab a color from your swatches or Color Picker and fill in your Background layer with the Paint Bucket (‘G’). 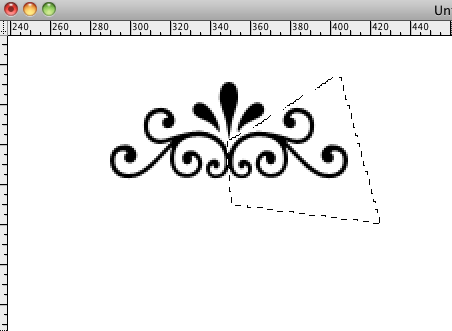 Grab your Crop Tool (‘C’) and select the space inside of your box defined by the Guides or Grid. If you are using the guides, your lines will turn red once you have gotten the entirety of the box. Once you’ve gotten your selection, press Enter. 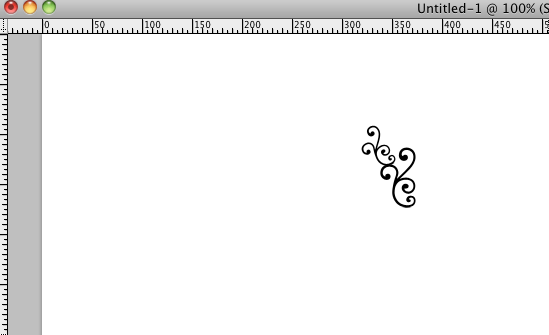 Test your pattern out by creating a New Document. 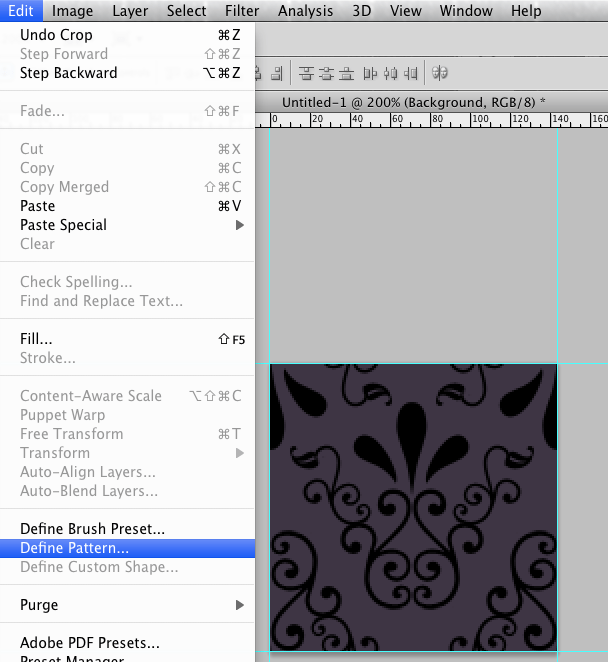 Grab your Paint Bucket (‘G’) and at the top left corner of your window, change the mode from Foreground to Pattern. 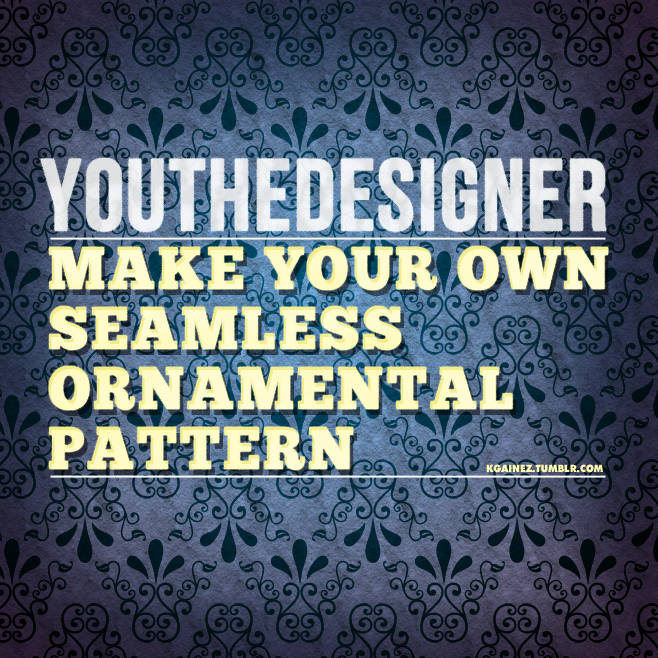 Find your pattern and fill in your space. You are finished! Kendra Gaines is a graphic designer from Virginia, United States. She designs for print, brand identity and websites. Visit her blog on tumblr and folllow her on twitter.